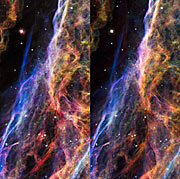 The NASA/ESA Hubble Space Telescope imaged three magnificent sections of the Veil Nebula in 1997. Now, a stunning new set of images from Hubble’s Wide Field Camera 3 capture these scattered stellar remains in spectacular new detail and reveal its expansion over the last years. In 1997, Hubble’s Wide Field and Planetary Camera 2 (WFPC2) photographed the Veil Nebula, providing detailed views of its structure. Now, overlaying WFPC2 images with new Wide Field Camera 3 (WFC3) data provides even greater detail and allows scientists to study how far the nebula has expanded since it was photographed over 18 years ago. Despite the nebula’s complexity and distance from us, the movement of some of its delicate structures is clearly visible — particularly the faint red hydrogen filaments. In this image, one such filament can be seen as it meanders through the middle of the brighter features that dominate the image. Astronomers suspect that before the Veil Nebula’s source star exploded it expelled a strong stellar wind. This wind blew a large cavity into the surrounding interstellar gas. As the shock wave from the supernova expands outwards, it encounters the walls of this cavity — and forms the nebula’s distinctive structures. Bright filaments are produced as the shock wave interacts with a relatively dense cavity wall, whilst fainter structures are generated by regions nearly devoid of material. 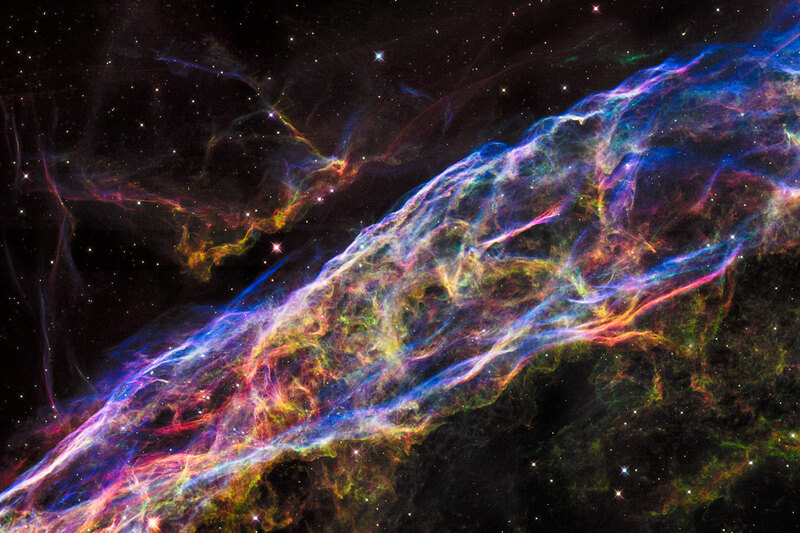 The Veil Nebula’s colourful appearance is generated by variations in the temperatures and densities of the chemical elements present. The blue coloured features — outlining the cavity wall — appear smooth and curved in comparison to the fluffy green and red coloured ones. This is because the gas traced by the blue filter has more recently encountered the nebula’s shock wave, thus still maintain the original shape of the shock front. These features also contain hotter gas than the red and green coloured ones . The latter excited longer ago and have subsequently diffused into more chaotic structures. 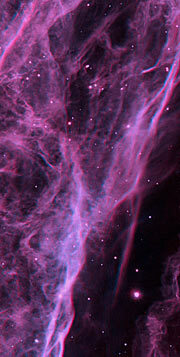 Hidden amongst these bright, chaotic structures lie a few thin, sharply edged, red coloured filaments. These faint hydrogen emission features are created through a totally different mechanism than that which generates their fluffy red companions, and they provide scientists with a snapshot of the shock front. The red colour arises after gas is swept into the shock wave — which is moving at almost 1.5 million kilometres per hour! — and the hydrogen within the gas is excited by particle collisions right at the shock front itself. Despite utilising six full Hubble fields of view, these new WFC3 images cover just a tiny fraction of the nebula’s outer limb. 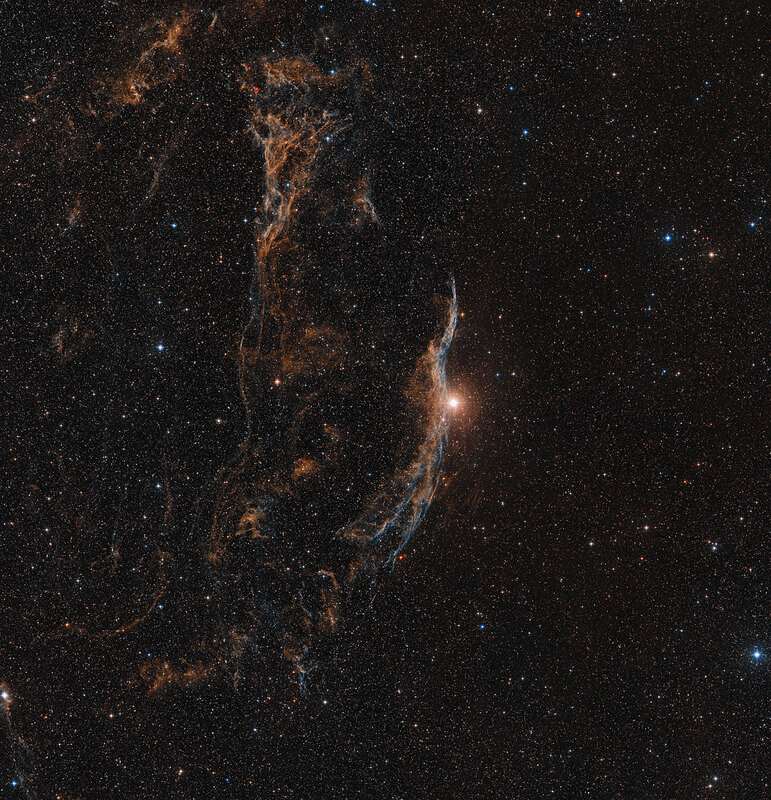 Located on the west side of the supernova remnant, this section of the outer shell is in a region known as NGC 6960 or — more colloquially — the Witch’s Broom Nebula.